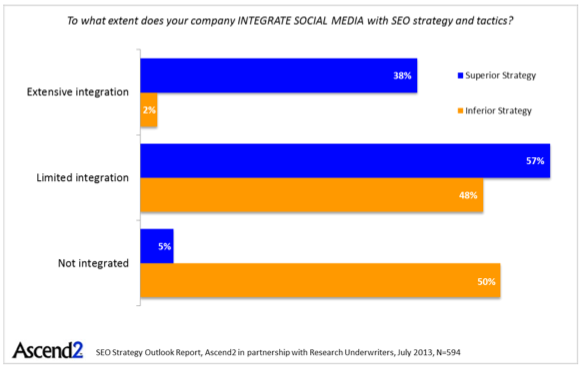 Most marketers are familiar with Search Engine Optimization (SEO) on some level. Using the reach of search engines like Google or Bing to fuel your marketing campaign has been a successful strategy for years. But as social media grows as one of the top platforms to reach consumers, new approaches to digital marketing have emerged. One of the top strategies used by businesses looking to maximize their reach online is Social Media Optimization (SMO). Aside from that, the benefits of social media marketing have been well documented. If you want a solid overall approach to online marketing, you need a healthy balance of SEO and SMO. A lack of social media strategy has been a roadblock for companies for a while now. Partly because it’s still fairly new, and also because social media is always changing. Twenty-eight percent of brands feel that a lack of strategy is the top barrier keeping them from becoming a social business. In order to optimize your social media marketing campaigns, you have to have a strategy with clearly defined goals and objectives. One of the core competencies for SEOs is the ability to do keyword research. Keyword research is all about identifying the phrases and topics your target audience is searching for, so you can create relevant content for them. The same thing applies for social media optimization. You need to know what topics, hashtags and keywords your target audience uses so you can share content that’s relevant to their interests. Keyword research will also help you learn which hashtags and phrases to use in your social media posts so you have a higher chance of being found when people search for content relevant to your brand. Here’s an example. Let’s say you’re a vegan clothing brand in Chicago. People Tweeting about tasty vegan restaurants in Chicago or searching the hashtag #vegansofchicago on Instagram are more than likely a part of your target audience. So naturally, you want to make sure your social media posts show up for those types of searches. But how do you know which keywords are going to be the most important to your brand? SEOs use a variety of tools to find out how often certain keywords and phrases are searched (search volume). But those numbers don’t necessarily correlate to social media use. In order to get an idea of how often a keyword is used on social, you can use our Twitter keyword report. Most brands use this report to track trends in their branded keywords and hashtags. But you can also use it to do a little social media keyword research! Start by coming up with a list of keywords your target audience might use. 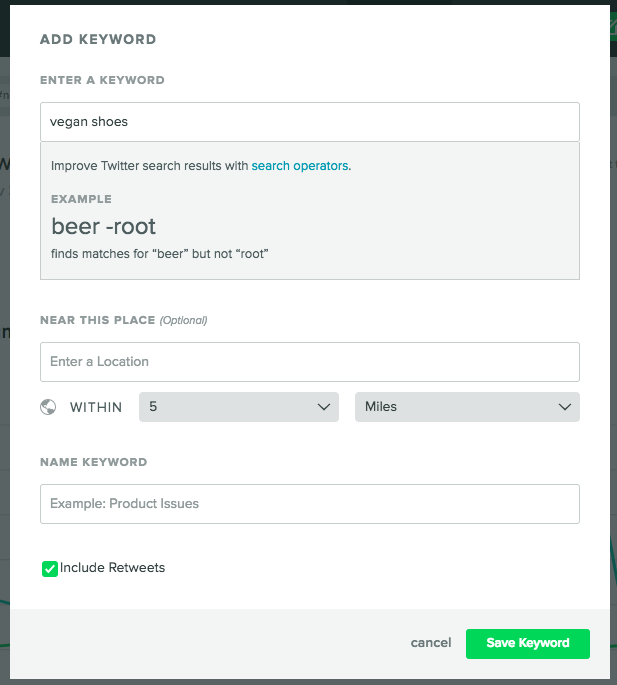 Then, go into the Twitter Keyword report and add your keywords. 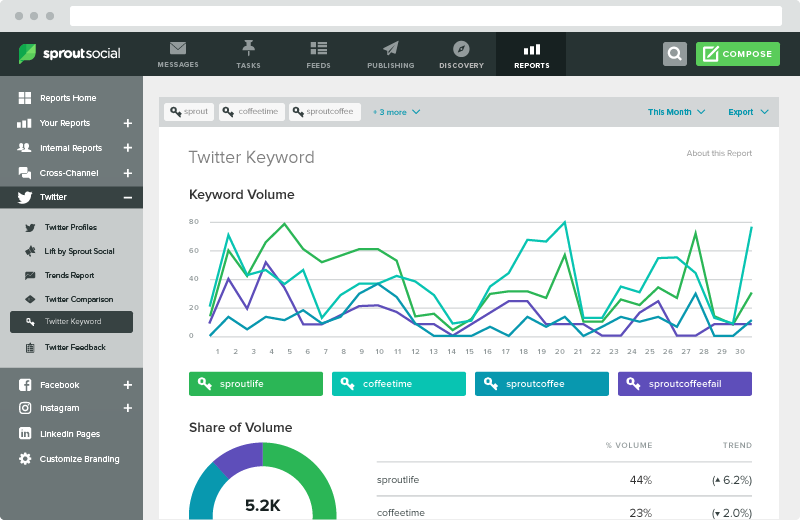 Now, you’ll be able to see the keyword volume of all your target phrases over time. Pay attention to the phrases with the highest volume, then start adding them into your social media posts. For SEO, optimizing your website is crucial. The content on every page helps search engines understand what your website is about. So when people are searching for topics relevant to your site, search engines know to recommend your content. Social media optimization is very similar. But instead of optimizing your website, you need to optimize your profile. Creating your profile seems like a pretty simple task, yet it’s one of the first areas of SMO where businesses fall short. Think of your company’s profile page as your foundation. If it’s weak, it’s hard to build anything on top of it. Here’s what it takes to build a strong foundation. Profile photo: Your profile photo should be your company logo. You can use a head shot of yourself if you’re a freelancer, consultant or personality. Username: Use your company name. 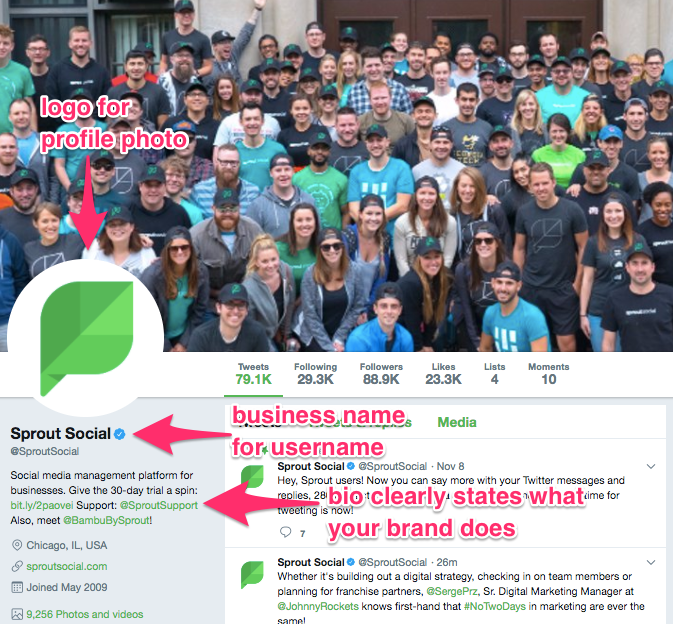 Social media username availability is starting to become a big factor for brands when they’re choosing a business name. Using your brand name makes it easier for customers to find you when they’re searching for your profiles on social. You can use a tool like Knowem to check if your company’s name is available on different social media channels. Bio: Clearly state what your company does. If possible, place a trackable link back to your website within your bio to drive more traffic. Using relevant keywords in your bio will also give your page more visibility in search. Most importantly, fill out your profile completely. Sites like Facebook and LinkedIn let you enter a lot of information about your company. Unfortunately many businesses leave these fields incomplete because they rush through the process. But the more complete your profile is, the more your page will stand out. Pro Tip: Dedicate a block of time for completing your social media profiles 100% so you can give it the attention it deserves. You’ve probably heard the saying, “Content Is King” when it comes to SEO. Well the same thing is true when we’re talking about SMO. Content drives social media. You can’t succeed with social media marketing without sharing quality content. Ideally, your strategy should have a mix of both. Original content is content that’s specifically made for social media, and is usually part of a campaign. For instance, when Netflix launched its #NetflixCheating campaign, they created original graphics to share on Twitter. Curated content is content that’s shared from various sources around the web. Content curation is more than just tweeting out links. In order to optimize it for the best results, you should only share content that’s valuable and relevant to your audience. Quality always beats out quantity. Determine what content your audience finds the most relevant by measuring the engagement for each post. Guy Kawasaki is one of the top Twitter users/experts in the world, and his Tweets largely consist of curated content. 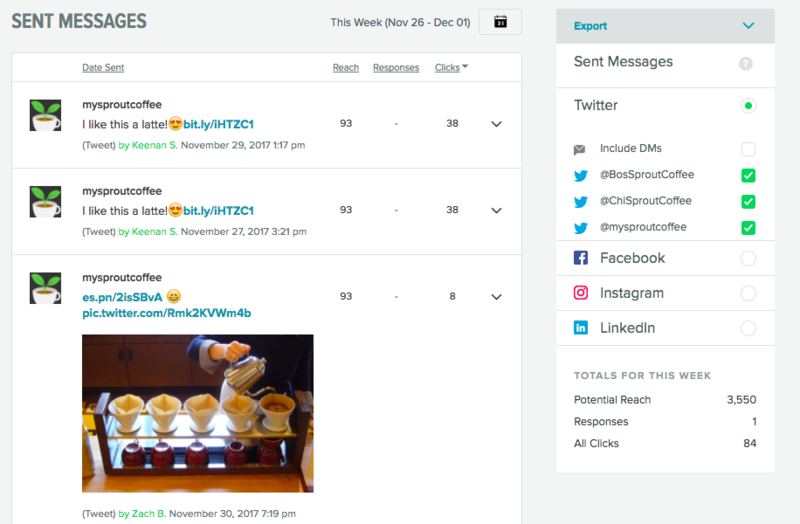 You can use Sprout Social’s sent messages report to see exactly which content of yours gets the most engagement across all of your channels. Once you’ve identified them, you can start sharing similar content. When you send out a Tweet or Facebook post, don’t just use the same headline each time. Some headlines will work better than others. Plus, using a variety of headlines makes your feed fresh. Your followers probably don’t want to see the same exact Tweet or Facebook post from you five times in a row. Here’s an example of two Tweets promoting the same article. Notice how they each have different copy. 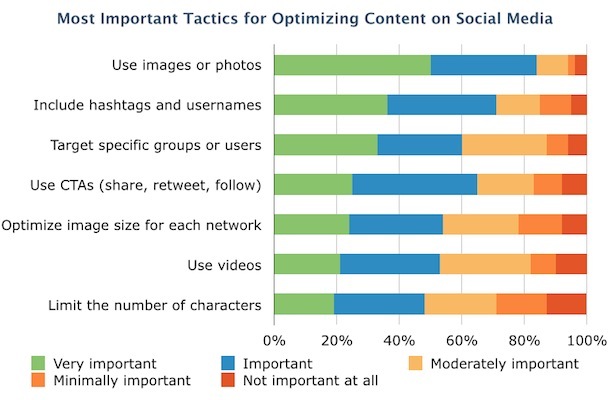 A study from B2B Marketing Mentor found images were the most important tactic for optimizing content for social media. Include high quality images in your social media updates whenever possible. You can use our very own image resizing tool, Landscape, for free to make sure all of your images are sized correctly for each social media site. There’s nothing worse than having a bunch of pixelated stretched out images in your Twitter feed. Pro tip: Include a featured image in all of your own blog posts. Whenever people share your content on social media, the image will automatically be included. Check out this post on how to use Twitter cards for more info. Hashtags help with social media optimization by giving your posts more reach, and making it easier for your content to be found even by people who aren’t following you. Look at what hashtags influencers in your industry are using. Use these tools to help. Search for trending hashtags, and see if you can relate them back to your industry or brand. Create your own hashtags to track specific social media marketing campaigns. Just avoid fails like these. Twitter gives you up to 280 characters per Tweet, but that doesn’t mean you have to use them all. Knowing the ideal status update length can increase the likelihood of people engaging with your content. We actually created an entire post with the ideal length of every social media post. The time you post is just as important as what you post. What’s the point in sharing an amazing photo on Instagram if nobody sees it? Here are some tips to optimize your social media posting schedule. The optimal posting time depends on your audience and the social media site you’re using. 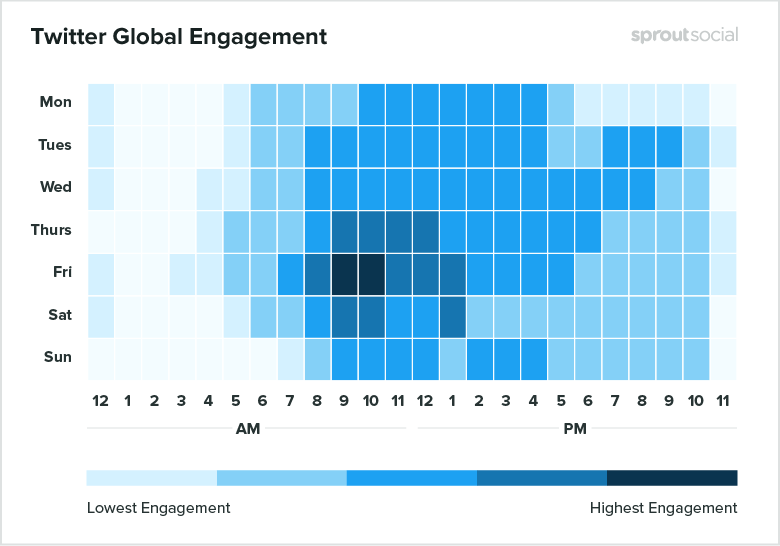 Luckily, tools like Sprout Social are able to make this process a lot easier by calculating the best time to post on your social media accounts for the highest engagement. We also did some research into the best times to post on social media, which will help give you a good starting point. Stay organized by making a social media editorial calendar for your business. Just like with SEO, you should track your SMO efforts with social media analytics. Some of this can be done through Google Analytics using UTM codes. UTM codes and shortened URL’s allow you to attribute the traffic your website gets from social media to a specific channel or campaign. 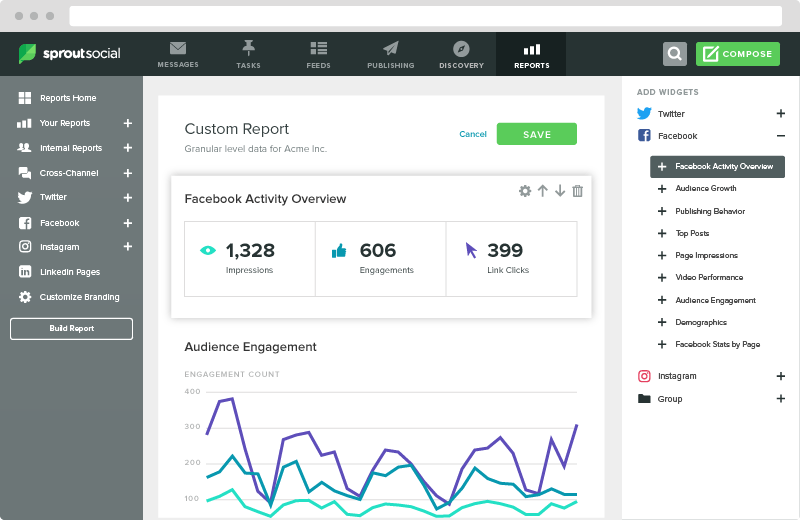 In addition to that data, use the reports you get from your social media marketing tool to get a full picture of the impact of your campaigns. Aside from tracking traffic, tie in social media specific metrics too. A great place to start is Avinash Kaushik’s four social media metrics. Kaushik’s metrics are good because they’re straightforward and focus on the key aspect of of social media—engagement. They answer the question: Do people like what you’re sharing? Social Media Optimization can drastically improve the way you approach marketing on Facebook, Twitter, Instagram and other social media sites. Start taking a strategic approach to social media marketing and amplify your results.